A great few days away with Angela & Dave. We spent Friday night at Dave's wonderful farm near Nenthead in the North Pennines and then went up to the chalet by Loch Sunart, at Resipole Farm on Saturday. We took the Buccaneers, they took Dave's open boat. We were blessed with good weather for most of our stay. We could see Angela eyeing up the kayaks on Sunday, so Julie suggested she try her boat. Ange took to it like a duck to water! I think Angela's next purchase might just be a sea kayak! That's Angela in Julie's boat above. A deceptively calm-looking ( it wasn't!) 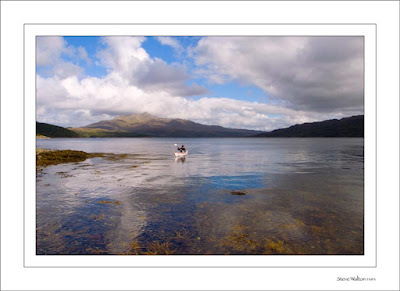 Loch Sunart with the magnificent Beinn Resipol as a backdrop. We saw a number of common seal hauled out on rocks around Garbh Eilean. It never fails to surprise and delight me, no doubt every other sea paddler too, how seals will slide into the water and approach kayaks, seemingly out of curiosity. We spent several minutes playing with the seals before continuing our journey to "Very Good" with a push from the ebb tide. "Very Good" is a car park and picnic area by the loch that Dave & I had marked on the map when we did a recce to find suitable put-ins and get-outs.